You’re in the right place to find all sorts of useful information about Anguilla. Use the Island Guide below to read an overview about the island, and then use the ‘tabs’ above to learn more about local services, what to do, where to eat, and more! We understand you may not know much about Anguilla - that’s what we’re here for! Some 4,000 years ago, Anguilla was a lush island covered in dense rain forest. It was discovered by Amerindian peoples from South America’s mainland. They called Anguilla “Malliouhana”, which meant arrow-shape sea serpent. Evidence of these Amerindians as old as 3300 years has been found at the eastern end of Anguilla. Shell axes, conch shell drinking vessels, and flint blades from the pre-ceramic era have all been found on Anguilla. Christopher Columbus sailed by Anguilla in 1493 but never landed. 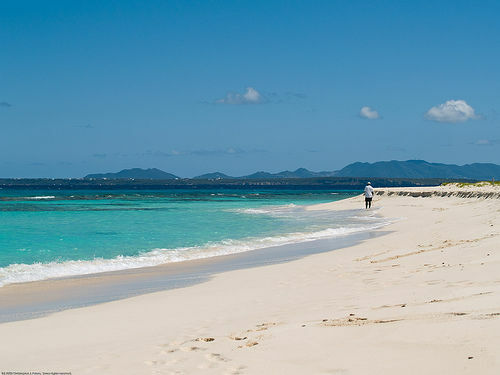 During this time the Europeans changed the island’s name from Malliouhana to Anguilla, for its long eel shape. Anguilla first became colonized in 1650. English settlers found that the soil in Anguilla was good for growing corn and tobacco, so plantations began. When they arrived on the island, there were no Amerindians inhabiting Anguilla, but by 1656 Indians from a neighboring island destroyed their settlement. In 1666 a French expedition captured Anguilla. The following year the island was returned to Britain under the Treaty of Breda. In 1744 Anguilla, assisted by privateers from St. Kitts captured the French half of neighboring St. Martin. Retaliation came on May 21, 1745, when two French frigates and some small craft attacked at Crocus Bay. The Anguillians repulsed them in less than fifteen minutes. St. Martin was returned to the French in 1748 under the Treaty of Aix-la-Chapelle. Anguilla possessed a plantation economy like most of the Caribbean in the 1800s. Rum, sugar, cotton, indigo, fustic and mahogany were its chief exports. However, the soil on Anguilla was thin and unreliable rainfall made conditions for a plantation economy unfavourable. Estates were small and could not employ many slaves. Eventually, slaves began to develop into individual peasant proprietors, fisherman or sailors, which increased their personal independence. The 1830’s brought the union of St. Kitts -Nevis-Anguilla on Britain’s recommendation. In 1958, St. Kitts -Nevis-Anguilla became part of the Federation of the West Indies. The Federation collapsed in 1962, which resulted in individual constitutions for most islands St. Kitts -Nevis-Anguilla was made an associated statehood, a political decision that sparked the Anguilla Revolution. Anguilla wanted its independence from the state and the proposed union was not a viable option for the island. May 30, 1967 is celebrated today as Anguilla Day. This day commemorates the repulsion of the Royal St. Kitts Police Force from the island. On December 19, 1980, Anguilla became a separate Dependent Territory. LeBron James, Justin Bieber, Billy Crystal, Ellen Degeneres and Robert De Niro have been known to frequent the island. Prickly Pear Cays is two small, uninhabited islands located just 6 miles from Road Bay Anguilla. They are divided by a narrow channel into Prickly Pear east and Prickly Pear west. Both offer 360 degrees of powdery sand and turquoise water. It's popular among swimmers and snorkelers looking for a less crowded experience. Getting to Anguilla and getting around. Our transportation tips will help make your trip smoother. More good sand advice. All visitors must present a passport upon entering Anguilla along with a return or onward ticket, all documents needed for next destination, and sufficient funds for the duration of their stay. A visa is not required for a maximum stay of 3 months. All Americans traveling by air outside the US are required to present a passport to re-enter the US. You can fly directly to Anguilla's Clayton J. Lloyd Airport from Puerto Rico via Seaborne and Tradewinds, or opt to fly directly to St. Maarten for easy transfers to Anguilla with Anguilla Air Services. On the left. Average speed is about 30 mph. A valid license from resident country required to obtain a temporary Anguillian drivers license for US$25.00 that is issued on the spot by car rental agencies. Renting a car is the best way of getting around the small island of Anguilla, allowing for the most flexibility and mobility, even if it's just for a day or two of sightseeing. Public transportation, apart from a usually reliable taxi system, is non-existent. Vacationers don’t just stay in Anguilla villas - they come to paradise to get married and celebrate their honeymoons! A 48-hour island registry is required prior to marriage. There is a mandatory fee of $284.00 USD, and birth certificates, passports and divorce papers (if applicable) are required. The license application is available from the Judicial Department (open 8:30 a.m. to 4:00 pm weekdays) and must be completed and processed. If on island for 15 days prior to your wedding, the cost is US$40.00 USD. Before making their way to Anguilla villas, vacationers like to know a little bit of helpful information to make them feel more at home during their stay. Take a look at our travel tips to make your time in villas in Anguilla even more relaxing. 16 miles long, 3 miles wide, 35 square miles. Eastern Caribbean dollar (EC) - U.S. dollars are widely accepted. Most restaurants add a 15% gratuity. Villas and hotels apply a 10% tax and 10% service charge to all reservations. Area code (264), plus 497, plus the local number.